I’ve bounced between web design and development for years. As someone who has never had a formal instruction in visual design, Erik Kennedy’s primer on this Medium post isn’t a bad start for those new. I especially like his thought processes behind rule three: double your white space. Might be a bit overkill compared to what’s absolutely necessary, but it’s one of the first mistakes I see from design newbies, especially developers starting to dabble in design work. It’s clear the PS4 is an unqualified sales success. It’s sold around ten million units, roughly 2 to 1 against the Xbox One. Those are impressive enough sales to be a key factor in Sony’s profitability for Q1 2014 after years of losses. Core gamers, often with large game libraries, have the most immediate demand for a more organization-friendly UI. Yet it’s not just a traditional fan base that may juggle between many apps. Popular premium subscription services like PS Plus, Xbox Live Gold and the recently announced EA Access offer new “free” game downloads at regular intervals as long as you’re a member. And casual gamers that only buy a few $60 AAA titles may buy more games as inexpensive and free-to-play indie titles proliferate on the PSN store. Also, in 2014, customization isn’t just a nice to have, it’s essential to the DNA of most modern tech gear. Every smartphone, tablet, or laptop allows you to organize apps into folders or across multiple home screens. If I’m paying the same price for a dedicated gaming console as I am for the next iPhone, I expect basic levels of customization to define it as my own. There’s a philosophical argument as well: gaming is going through the same pattern as all media post-internet, splintering into fragmented, niche genres. With so many on the same base console but able to purse much more individualistic tastes, some basic UI customization helps distinguish my PS4 from somebody else’s. With such a large install base, major UI changes can be tricky. Thankfully, the UI doesn’t need a redesign from the ground up, just evolutionary growth into a multi ribbon system. Users create as many additional ribbons as they want and move apps to any ribbon they choose. To keep things straightforward, like with iOS, there are no extra “shortcuts” or “aliases” of app icons, only a single canonical icon within a set of ribbons. The original, single horizontal ribbon remains unchanged by default. 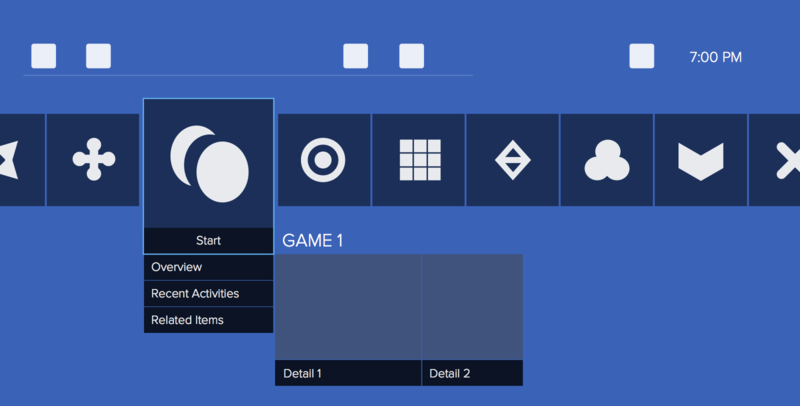 Navigation and controls are identical to before, retaining the three row structure: settings, notifications and trophies are in the top row, apps in the middle, and details on an individual app or game at the bottom (figure A). Only one ribbon appears at a time. Users tap the DualShock controller triggers (L2, R2) or speak voice commands to cycle through their ribbons. As each ribbon appears, the scrolling text region in the screen’s top left briefly displays the ribbon name (figure B). 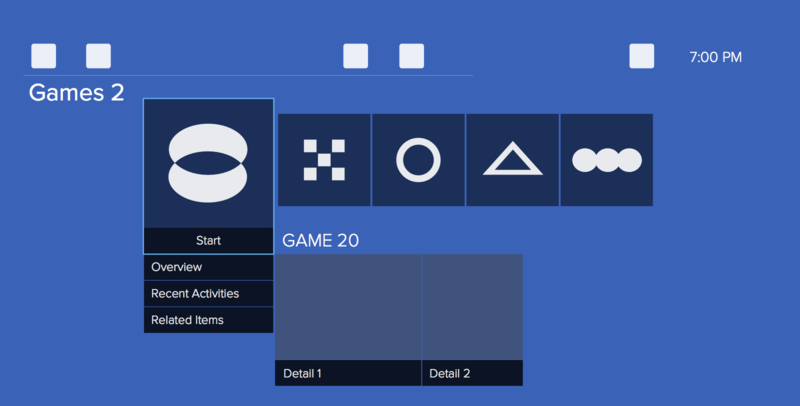 To reorder apps in a single ribbon or move an app to another ribbon, users enter a special “app reorder mode” by holding both DualShock bumpers (L1 and R1) down for a few seconds. This is a nod to the “hold an icon until it wiggles to edit” paradigm in most mobile OSes. The UI’s look in this mode changes significantly: the top and bottom rows are removed and the app icon the cursor is selecting no longer enlarges the icon. In addition, new text labels are added around the ribbon to clarify the name of the active ribbon and its order (Figure C). 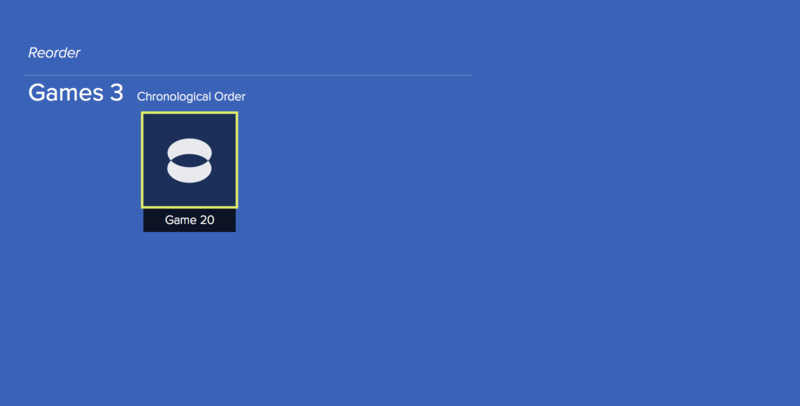 Controller bumpers cycle through the current ribbon’s order options: chronological (default), alphabetical, and manual. X selects an individual app for movement. Options opens up a menu to change the current ribbon’s name. Upon creation, all ribbons have an automatic, sequential ordering naming convention like “Games 4” and “Games 5”. But for users with a lot of content or who want a particular organization, custom labels are helpful. The D-pad and analog sticks navigate between ribbons (up/down) and individual apps on a ribbon (left/right). Square exits app reorder mode. 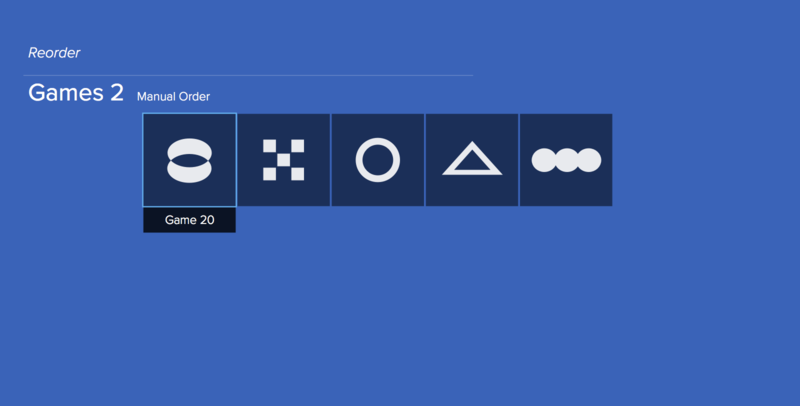 Once an icon is selected, a visual change (e.g. change in selected icon border color or thickness, icon appears to hover) indicates it’s available to move. Up and down always shuffles the app between ribbons. To keep things simple, the ribbons cycle with a definitive beginning and end; the first is at the top, the last is at the bottom and there’s no looping. This way, to create a new ribbon, all it takes is moving ‘down’ from the last occupied ribbon (figure D, E). 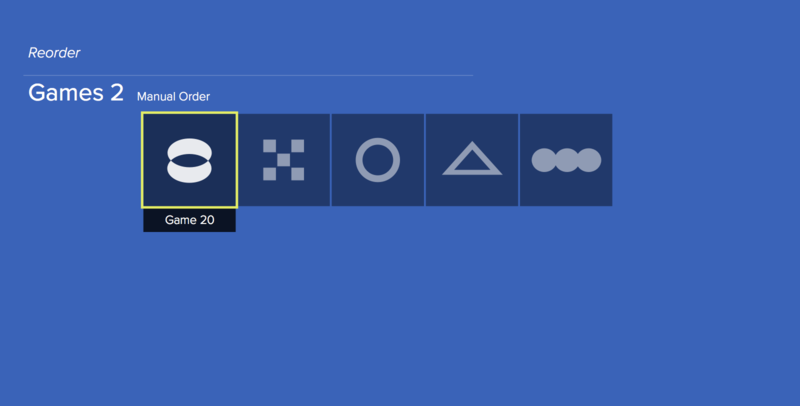 Conversely, to remove a ribbon the user removes all icons from it. Figure D: Game 20 is selected, ready for movement. Figure E: Moving Game 20 "down" once auto creates a new ribbon. 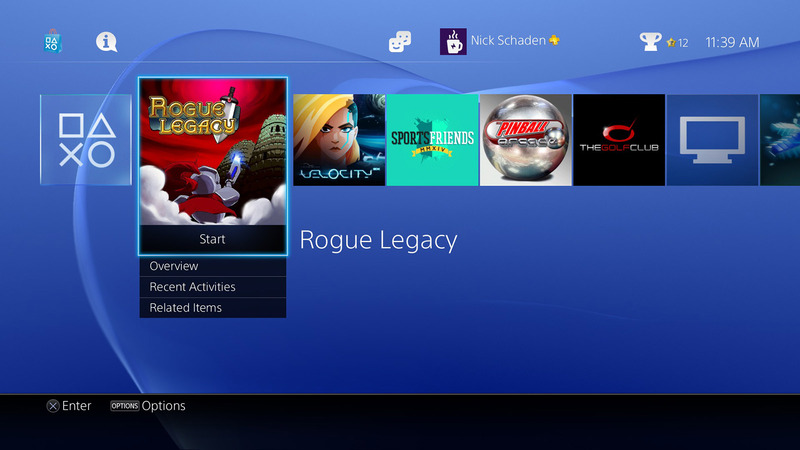 Adding smarter organization isn’t going to move the needle for PS4 sales. Nor is it likely to affect Sony’s ongoing battle against the Xbox One, a fight centered on game selection, exclusives, and raw performance. Instead, a stronger UI makes users happier while improving their attachment to the device. For a dedicated gaming console in an increasingly mobile-centric world, that’s an underrated, compelling factor in the long run. Microsoft promotes the Xbox One as an all-in-one solution for your living room needs: gaming, film, cable TV, even home exercise. But the Xbox One leans on convergence to a fault. It’s a console whose overstuffed feature set, for now, has left it vulnerable on both price and its user interface. While core gamers kept sales strong over the holidays I’m concerned that the console will have a rough future with a mainstream audience. Its convergence problems start with its $500 price tag. Devices that already carry the same feature set of core streaming services (e.g. Netflix, Hulu Plus) as the Xbox One are $100 or less. Granted, the Xbox One adds on high end gaming, voice and gesture UI integration along with limited cable TV control, but those additions for $400 are a hard sell for everyday consumers. And I doubt we’ll see a price drop anytime soon; the console requires high-end expensive gaming hardware to compete with Sony’s PS4 over next gen gaming. The Kinect, one of the Xbox’s purported main innovations, drives the price higher. Microsoft tacks on additional fees as well: a $60/year Xbox Live subscription is required for most functionality, a policy unheard of on competing tech devices like the PS4 or Roku. 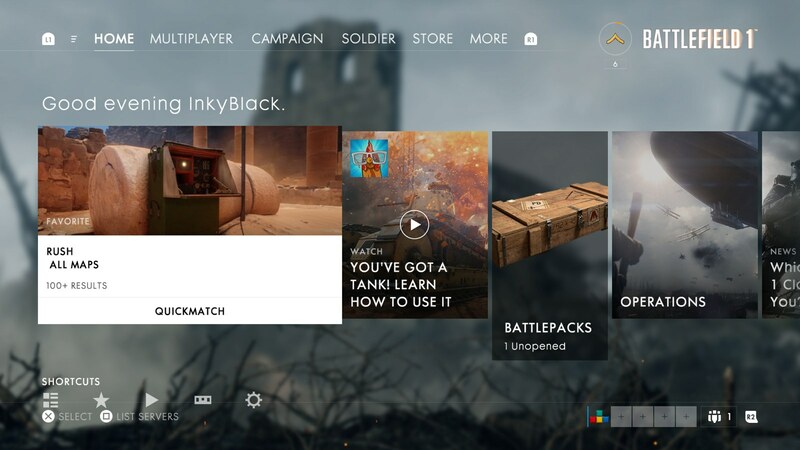 Convergence across diverse activities also adds complexity to the Xbox One’s UI, an extra hurdle for mainstream adoption. Just compare the console’s preferred interaction method – voice – against interaction on competing media and tech devices. From my own testing, Xbox One voice commands largely work. But it still feels like a feature trying to find its footing; about 20% of the time I have to repeat myself or a command takes me in an unwanted direction. 80% reliability is a good start, but that’s 15% short of what it should be given the competition’s astounding performance. Consider the 1 to 1 touch interaction on a modern iOS or stock Android smartphone or tablet. Or the tried and true keyboard and mouse inputs on a desktop or laptop. Even buttons on a remote control for the cable box. These aforementioned devices “just work.” Granted, Microsoft’s voice technology is new and will improve, and there’s a game controller for backup navigation. But historically users outside a tech or gaming enthusiast base show little patience for new input technologies that work unreliably. “Snapping” an application like a web page or Skype alongside the right side of the screen seems like it would be used in a rare scenario. Minority Report style Kinect gestures to move around the UI that are slow and awkward. A Windows 8-like interface that’s visually striking, but occasionally confusing with a menu of very similarly sized and colored boxes doing different things. Microsoft would argue that ambition takes time and that the Xbox One’s rough patches will be smoothed over soon. And I want the Xbox One to succeed; strong competition from Microsoft’s console leads to better technology from Sony, Nintendo, Apple and Google. However, other living room tech isn’t standing still. Rumors suggest the next Apple TV iteration will be ambitious. Sony’s PS4 runs select multi-platform games at higher resolutions with a more straightforward, gaming focused UI, which could appeal to the core gaming market. Drive can only take a console so far; with Microsoft’s missteps on price and UI, it’s unclear if the company can deliver on its promise. TechCrunch posts a fairly troubling article on what’s become commonplace in Facebook land: UI slickness to make it more likely that you’ll allow apps to access your personal information.